At Dr. Danielle Doré Orthodontics, we believe that it’s never too late for a healthy, beautiful smile! That’s why Dr. Doré provides quality, individualized orthodontic treatment to patients of all ages, including adults. With two office locations in Crowley and Lafayette, LA and all the types of braces adults love wearing, we make it very convenient to improve your smile! 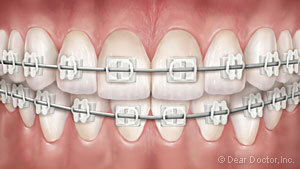 If you’re an adult who thinks braces are just for kids, we’ve got some great news for you! Thanks to many advances made in orthodontic technology, today there are several types of braces geared specifically toward adults like transparent braces that are hardly visible and clear removable aligners that make treatment both discreet and convenient. Undergoing orthodontic treatment as an adult can improve your overall health, oral and dental hygiene, physical appearance, and psychological well-being. Orthodontic treatment can also reduce your risk of dental decay, gum & bone loss, and TMJ pain, all while giving you a big boost of self-confidence knowing that your smile looks nothing short of amazing! It truly is never too late for a new and improved smile and we have all the adult treatment options you’ll appreciate like:. 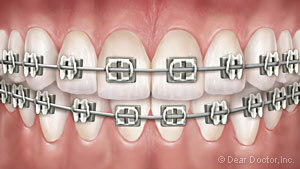 In-Ovation R Braces: Considered the next generation of metal braces, In-Ovation R braces are small, comfortable, and tie-less, meaning they don’t use any tiny rubber bands like regular metal braces. These braces which are bonded (cemented) to the teeth for the duration of the treatment process, provide a reliable, comfortable, and cost-effective way to move teeth. In-Ovation C Clear Braces: These are similar to In-Ovation R braces only they brackets are made from a clear composite material that blends in with the teeth, making them far less noticeable. When you choose our Lafayette clear braces, you can comfortably & conveniently breeze through the treatment process with complete confidence knowing that people are concentrating on you and not the braces on your teeth. 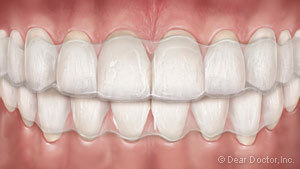 Invisalign Clear Aligners: One of the most popular treatments among adults is Invisalign. This treatment option consists of a series of clear, removable aligners that fit snugly over the teeth to move the teeth gradually, step-by-step. Because the aligners are removable, there are no food restrictions nor any oral hygiene hassles to deal with as you just take the aligners out when eating and when cleaning your teeth, and then pop them back in when done. If you want to discreetly improve your smile in the most convenient way possible, our Lafayette Invisalign treatment may be just what you’re looking for! Book a Time With Our Crowley & Lafayette Orthodontist Today! Dr. Danielle Doré Orthodontics is proud to provide quality, individualized treatment to patients of all ages at our two office locations in Lafayette & Crowley, LA. A large percentage of our patients are adults who’ve come to realize that now’s a great time to improve their smiles! To get started working on that straight and healthy smile you deserve, please request an appointment with Dr. Doré today. We look forward to seeing you soon and welcoming you to our practice where we improve lives one smile at a time!